1. Question: After I plug the USB cable on the moon light and outlet, how do I know whether it is charge or not? Answer: When it is charging, the indicate light near the charging port of the moon light will on; when it is 100% fully charged, the indicate light will off. 2 .Question: Can I adjust the brightness of the moon light by touch switch? Answer: Yes. Adjust the brightness of the moon light color can only be achieved by touch switch.Touch switch can change the color and light brightness. 3. Question: I received the moon light of the wrong size that I expected, in the pictures they seemed bigger? Answer: The real size of the moon light is 3.9 inches, on some pictures it seems that it is large,because the photo does not accurately convey the size, if there is no one to compare with. It is advised not to charge during use, so that the battery lasts longer. 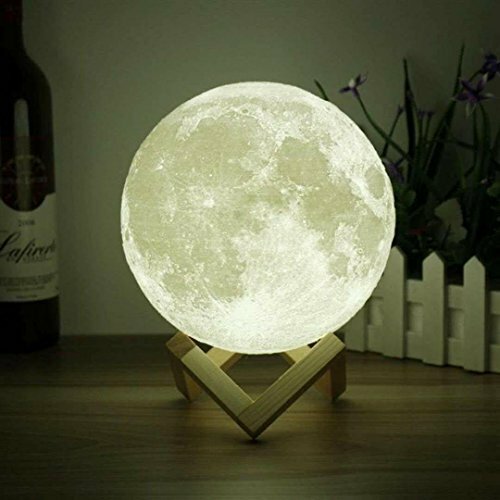 Do not put the moon lamp under the blazing sun for long time. If you have any questions about this product by 3D Space, contact us by completing and submitting the form below. If you are looking for a specif part number, please include it with your message.